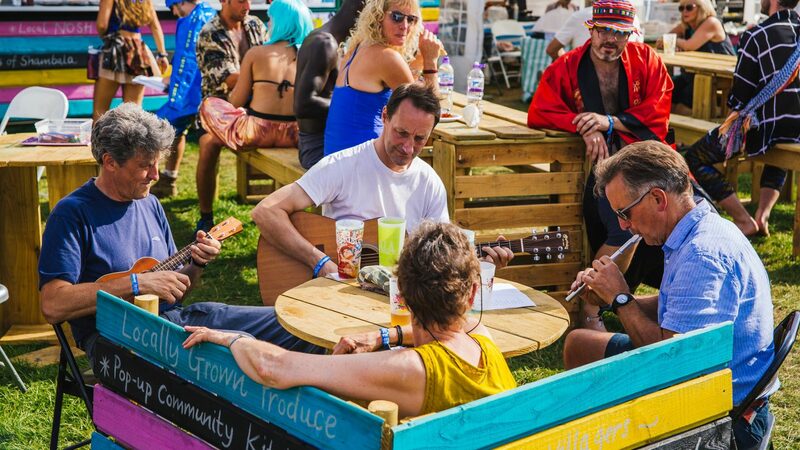 Nosh Community Café provides a space on site to enjoy delicious locally, sourced treats. Nosh sets up shop in Shambala, and provides an important link to the surrounding villages of Shambala’s Kelmarsh site. Through Nosh Café we give back to the communities that live right by our annual place of late-summer utopia. Through the café money is raised for the neighbouring villages of Great Oxendon, Clipston, and Arthingworth. 2017, saw over £8,000 raised for these communities. Money raised for Arthingworth enabled vital work on the village hall, where a resurfacing job enabled accessibility for all. A central space for the community, the hall is used by a range of groups and clubs, from the Parish Council to the Mother and Toddler Group, to Film Club and the Christmas Fair. The maintenance enabled by this money raised at Nosh Café provides a simple way for the hall to continue being a community hub, a place to combat loneliness, promote health and wellbeing, and build a vibrant sense of community. In the village of Clipston, money raised by Shambalans at Nosh Café has funded multiple local projects. This included: urgent repairs to the church which subsequently led to successful bids for heritage grants for its continued restoration; developing and expanding a new Community Café in the church annex, used particularly by young mother and the elderly; contributing to the upkeep of the village playing fields, including creating a rich woodland habitat for local critters; and also enabling the creation of a quarterly newspaper and website to keep the community connected and up to date with local events. Great Oxendon used the money in similarly brilliant ways, The money was used towards a series of ‘nice’ things – planting wildflowers, maintaining playing fields, used by the Great Oxendon Youth Club, and redecorating community spaces and buildings. Maintaining and making these spaces utterly lovely enables village activities to carry on serving the people of the community. The sustenance Nosh provides to us festival goers goes full circle to proving nourishment of the local communities to which it pays back into… be sure to pay them a visit on site this year!